In the half-century since their founding, the lives and lyrics of The Beatles have won the hearts of an international fandom spanning generations… and captured the interest of two Penn State professors. 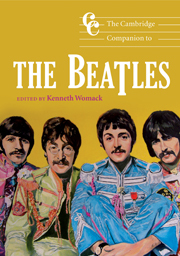 Catch a clip of The Cambridge Companion to the Beatles Editor Ken Womack and Contributor Jerry Zolten being interviewed on WPSU, reflecting on the group’s fascinating legacy and giving fresh insight into the causes, consequences, and enduring cultural power of the Beatles. And if you haven’t seen it yet, check out the book review by Beatlefan Magazine Contributing Editor, Kit O’Toole on blogcritics.org. If you are a Beatles fan looking to study their music and impact, The Cambridge Companion to The Beatles provides an excellent starting point. Chapters will make you rethink what you already know, and perhaps change your interpretations of their music. At the very least, the text spurs spirited discussion about various topics.